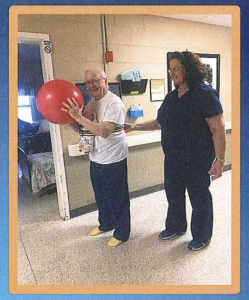 Mr. Roger Morris came to Smmit Manor after a bypass surgery. Mr. Morris did very well in Summit Manor’s therapy department. When asking about his stay at Summit, he states, “The girls on the floor work very hard to meet everyone’s needs, and the therapy is GREAT!” We want to with Mr. Morris the best when returning back home, just in time for spring planting on the farm.